Outdoor weddings in the typically mild weather of Autumn and Spring are particularly wonderful in New Orleans, and it's no surprise that these are the most popular months of the year to get married here in southeast Louisiana. This bride and groom were perhaps the happiest couple I had ever photographed... in almost every single photograph I captured that day, they are both broadly smiling like this! Expertly coordinated by Michele Adams of Unique Weddings in New Orleans, their ceremony took place in Jackson Square on a beautiful October afternoon in the French Quarter, with their reception being held at a now closed venue called The Foundry in the Warehouse District. Their officiant was Mary K. Norman, better known as "The Love Judge" for the many weddings she has conducted over her career as a New Orleans judge. Though she retired from public service in 2013, she does still occasionally perform ceremonies for couples both here and in the Florida panhandle area. The direction of the setting sun in late afternoon at this location in Jackson Square usually results in a pleasant rim light effect on the bride, and brilliantly illuminates her veil as well as was the case with this image. 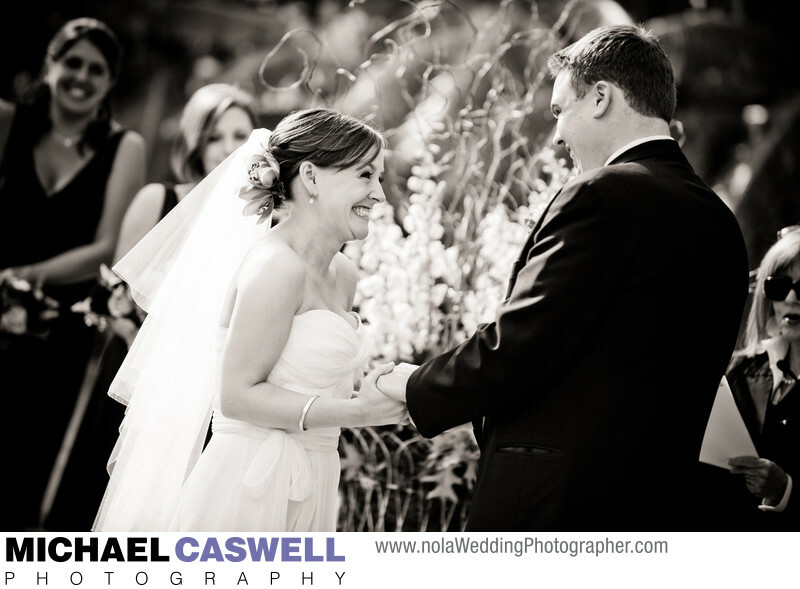 There are other options for outdoor weddings in the French Quarter, including several hotels and other primarily indoor venues that also have some outdoor rooftop space that can be used for this purpose, as well as many different courtyards large and small.